Naxional isn’t the place to stick to your regular American favorites that one may easily (and maybe comfortingly) find in their menu. This is where you stop playing it safe by choosing dishes with names that would require some roll of the tongue (although an order of their smoky fall-off-the-bone ribs won’t hurt either). A taste of Naxional’s rendition of this popular Latino street food alone is enough for you to fall in love with the place. Corn cobs generously slathered with chili butter, mayo lime and crumbed cheese creates a balanced pop of flavor. The play of zest and juiciness is a true party in your mouth. Let’s admit it, anything with the word “bacon” on it easily sells. But this gastronomic innovation, which is quite similar to your favorite jerky, is pure genius. Thick barks of bacon-cut pork belly coated with a caramel and coffee rub—an inventive twist to the sweet and salty mix of your good ol’ tocino—will definitely set your appetite. This should definitely be your go-to side with their mains. Its blast of flavors makes up for the lackluster impression you’d have after tasting their bland Naxional Paella, with the latter being considered a recipe that still remains unperfected to suit the taste of the local palate. The fried rice perfectly complements savory meat, adding a refreshing new taste to a carb staple. The Black Angus Picanha is an interesting cut served at the Latino restaurant. Picanha is a famous and best-selling cut in Brazil and other South American countries, and has a similar taste to your regular chuck that also has a sirloin texture. The muscles that make up the cut are also said to be the less used in a cow’s body, making the meat naturally tender and easy to cook. The Picanha is cooked with a layer of fat trimmings, its natural oils making the meat extra juicy and flavorful. Light plantain discs are topped with your choice of meat: carne (beef), cerdo (pork) or camarones (shrimp). We got to try the camarones and discovered a subtle sweetness in the smooth medley of fried plantains and guacamole, while the shrimp provided a fresh crunch followed by a bite of spiciness from its sofrito sauce. The South American flavors just keep surprising you with each bite. They have a lot of interesting liquid concoctions, but the foolproof choices would be coffee and mojito. Their Brazilian lemonade, an unlikely combination of lemonade and condensed milk, is also a definite must-try. Each dish served in the diner will surprise you with a size that’s good enough for sharing (but if you’re fully capable of eating their 300-gram steaks on your own, we won’t insist that you do). It’s not surprising, however, to want to fork off some bites out of your friends’ and family’s orders because everything looks vibrantly inviting—and with their servings, we assure you that you won’t be greedy enough not to share. 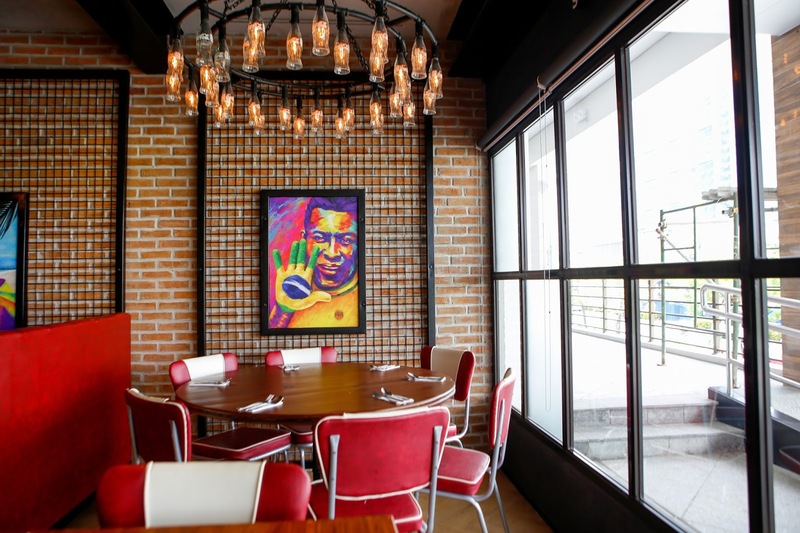 Street-art-inspired murals and framed paintings liven up the diner’s walls. Each of the artworks seen in Naxional, rendered in different styles and exuberant colors by a single artist, represents its partners (which includes Daniel Matsunaga, so this is one place on the list of where to spot him).